Mining ball mill, as the professional equipment for grinding ore materials, has low energy consumption, small investment, little noise, high productivity and other features, which has been not only widely applied into a variety of mineral processing operations, such as gold ore, copper ore, iron mine, lead zinc ore, tungsten ore, non-metallic mine and so on, but also applied into building materials and chemical engineering industries. HANDA mining ball mill adopts central drive, rolling bearing, side discharge, overflow discharge and lattice discharge, suitable for metal mine with less than 25mm feeding size and 200mesh output size grinding. Without gearwheel, the weight of equipment declines 10% and the energy consumption decreases 20% due to rolling bearing with grease lubricating, which saves lubricating station and is more suitable for the usage in cold weather. 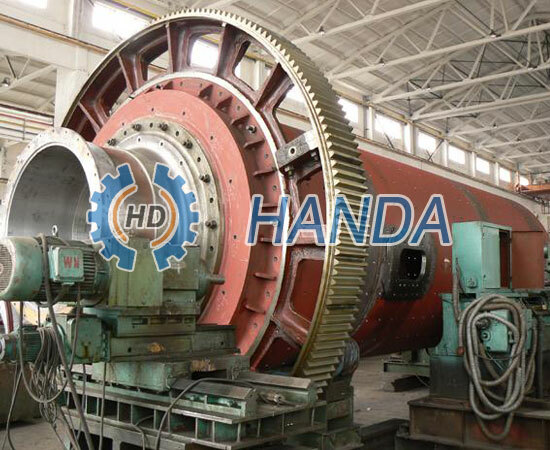 HANDA mining ball mill is able to save 20% energy by using rolling bearing because its unique structure can simplify technological process. When mining ball mill runs, feeding materials are entered into head feeder through conveyor or feeding machine; setting professional liner plate in the drum to protect inner wall from abrasion; using the advanced one chamber for grinding operation; choosing multiple chambers or one-chamber machine according to different requirements; there are different sizes steel balls as grinding media in different chambers. Suitable for different minerals treatment at different outputs, mining ball mill, jaw crusher, impact crusher, feeder, magnetic separator, flotation machine and high pressure grinding roller can compose a professional production line. Choose different sizes specialized equipment based on different materials usages and features, thus realizing the grinding and sorting operation of mineral.